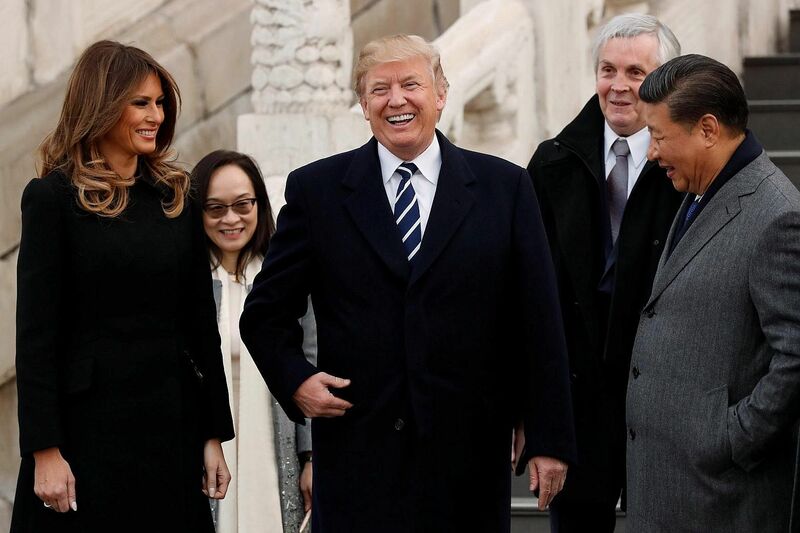 BEIJING (REUTERS, AFP) - US President Donald Trump arrived in Beijing on Wednesday (Nov 8) afternoon for the critical leg of his Asia tour to drum up an uncompromising, global front against the nuclear weapons ambitions of the "cruel dictatorship" in North Korea. The three-day trip is Mr Trump's first visit to the country since he took office in January. He is the first head of state to visit China since the 19th National Congress of the Chinese Communist Party (CCP). The five-yearly congress ended on Oct 24. Mr Trump heaped more praise on Chinese President Xi Jinping before touching down in Beijing but he also used a speech in Seoul on Wednesday morning to urge China to do more to rein in its Cold War-era ally. The Trump administration sees Beijing as the key to controlling North Korea, which depends on China for its economic survival and for 90 per cent of its trade. A senior White House official said will ask China to cut its financial links with North Korea and to abide by UN sanctions when meeting Mr Xi in Beijing. 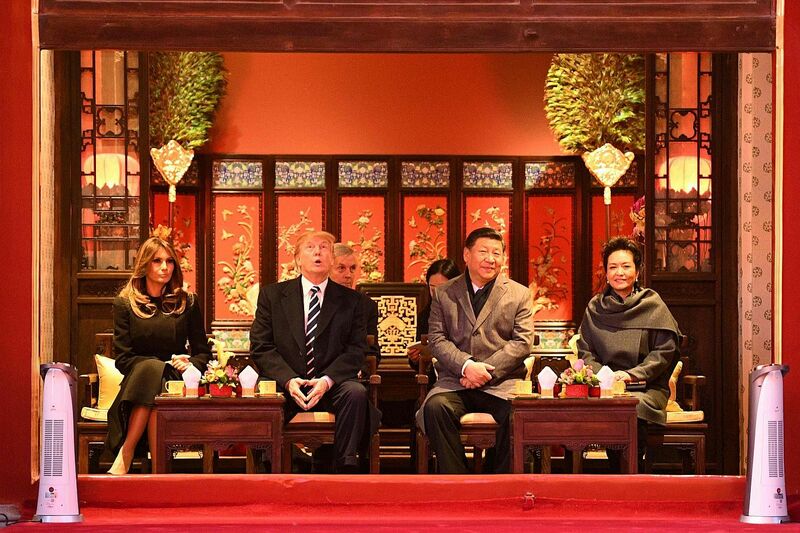 US President Donald Trump (2nd L) looks up as he sits beside First Lady Melania Trump (L) and China's President Xi Jinping (2nd R) and his wife Chinese First Lady Peng Liyuan (R) during a tour of the Forbidden City in Beijing, China on Nov 8, 2017. Speaking to reporters on-board Air Force One, the official said the US president was undecided on whether to declare North Korea a state sponsor of terrorism by the end of his trip. Mr Trump believes any talks with the North would require reducing threats, ending provocations and movement towards denuclearisation and that no deal can be achieved without denuclearisation, the official added. Earlier, Mr Trump congratulated Mr Xi for his reappointment as chief of the CCP, tweeting: "I very much look forward to meeting with President Xi who is just off his great political victory". Mr Trump's use of the term "political victory" for the outcome of last month's Communist Party congress was seen by analysts as an attempt to mollify Mr Xi before tough talks on trade and North Korea. "He's laying it on thick to put Xi in a good mood because he will have unpleasant things to tell him," said Jean-Pierre Cabestan, China politics specialist at Hong Kong Baptist University. After US allies Japan and South Korea gave the red-carpet treatment to Mr Trump, Mr Xi will offer him an extravagant "state visit-plus" with a tour of the Forbidden City, a military honour guard and a lavish banquet. Mr Trump has brought a business delegation along for the ride, with deals expected to be signed between the two countries, though analysts doubt that it will do much to allay US concerns about China's massive trade surplus.